Your website is the face of your business. 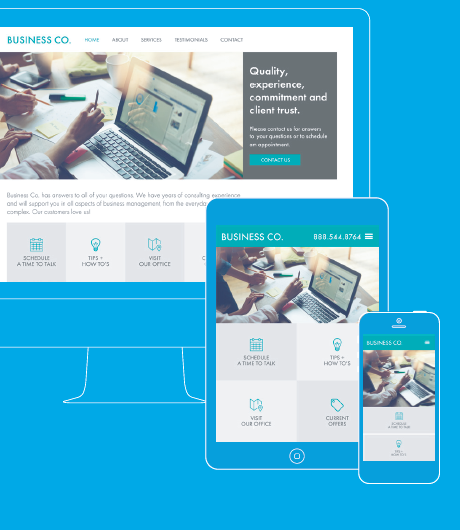 Make a lasting first impression with a professionally designed, mobile-responsive site that is tailored to drive traffic and conversions. Work with us to create or refresh your site and also access the TopMarketingAgency™software to track and manage your leads throughout their buying journey. Make a Lasting ImpressionImpress every visitor with a professionally designed site that includes engaging content and imagery. Every page is customized to reflect your unique brand and highlight your products and services in the most compelling way. From product information to pricing, your visitors will be armed with the information to take action. Speed Up Lead ConversionsProvide more opportunities for prospects to convert on your site. By employing best practices in responsive design and calls to action, visitors to your site will be able to quickly contact you via email, phone or by completing an intuitive web form. Become More DiscoverableMaximize your ability to be found by the right consumers at the right time. Ensure that your site is SEO-friendly and highly discoverable from within all channels including organic search results, local listings, maps and mobile search. Understand Your Marketing ROIConvert more of your website visitors into customers and understand which marketing channels and tactics are generating the most ROI for your business. TopMarketingAgency lead conversion software helps you track, manage and follow-up with your leads in real-time.